By now you know of the fatal crash that took Paul Walker’s life, the shining star from the popular film Fast and Furious. Paul Walker was in the middle of filming Fast and Furious 7 when he was killed in a car accident. Everyone is so shocked at what has happened and one of the questions is what Universal will do with the filming of the seventh film. News reports just popped up that they are going to continue filming and tribute the film to the late Paul Walker. It’s such a sad thing to think about with the very upsetting news, however it would probably be the best decision so they can show their respect to the actor. 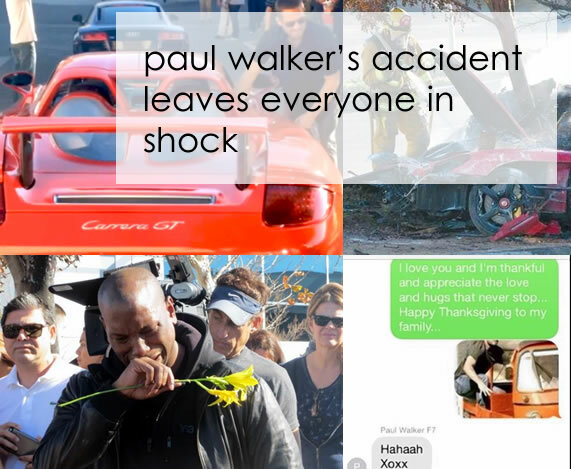 Paul Walker’s close friend Tyrese Gibson visited the accident scene with a flower and showed intense emotion as friends, family, and fans gathered around. Tyrese has been sharing some moments he shared with Paul on social media. You can see a text message he exchanged before the accident happened. It’s so sad to think about how life can change so quickly. R.I.P. Paul Walker.